Gowalla , like many other check-in services, has had trouble keeping pace with Foursquare. But the location startup is relaunching its service with an eye toward becoming more of a city travel guide, downplaying the role of check-ins in favor of discovery, travel and storytelling. The relaunch is an important step for Gowalla, which needs to find a better way to differentiate itself. It had tried to emphasize games early on with virtual goods called items, which could be collected and traded. But it announced last month that it was ending the use of items and was refocusing on its core mission of encouraging people to go out and explore the world. Now, Gowalla is looking to take a piece of the travel market, by building more than 60 curated city guides that help tell people where to go and what to see. The guides are written in-house by Gowalla, or by partners such as Disney (s dis) or National Geographic. They incorporate a lot of the location data provided by users in the past, including favorite user highlights arranged by category within a city. Users are also encouraged to build “stories” out of their travels, which start with check-ins but can be augmented by tagging other people and gathering pictures uploaded for particular stories. The emphasis is less on the initial check-in and more on the interaction that happens afterward, which can be put together and reviewed later. So Gowalla is trying to have it both ways, reaching out to travelers as well as locals looking to better discover their surroundings. There are some interesting ideas at work, but the features aren’t without precedent. Color has attempted to group pictures around specific spots, while Gogobot takes Foursquare and Facebook check-ins and location tags and turns them into sharable travel journals. But the bigger story is that it’s not easy to make a buck or establish a runaway success in the location business. Foursquare is the leader in dedicated location-based services with more than 10 million users, but even it is still working out how to turn on the revenue engine. Gowalla, which has about 2 million users, has had a tougher time capturing attention in this market. So it makes sense that the service would want to distance itself from Foursquare and try to occupy a space that straddles travel and local discovery. Will it be enough? It’s hard to say. In some ways, it could find itself overlooked because it’s not quite clear which audience it’s trying to hit between tourists and locals. I do like the idea of preserving memories and creating a lasting resource, but I’m not sure consumers will think of Gowalla for that. At least Gowalla is trying something new, and at this point, it looks like a necessary step for staying alive in the location market. You should do a story about how Gowalla committed Startup suicide by alienating it’s 2mil users. Gowalla still hasn’t communicated to its users that it’s not a checkin service anymore. Those of us who wanted a checkin service just switched to Foursquare. 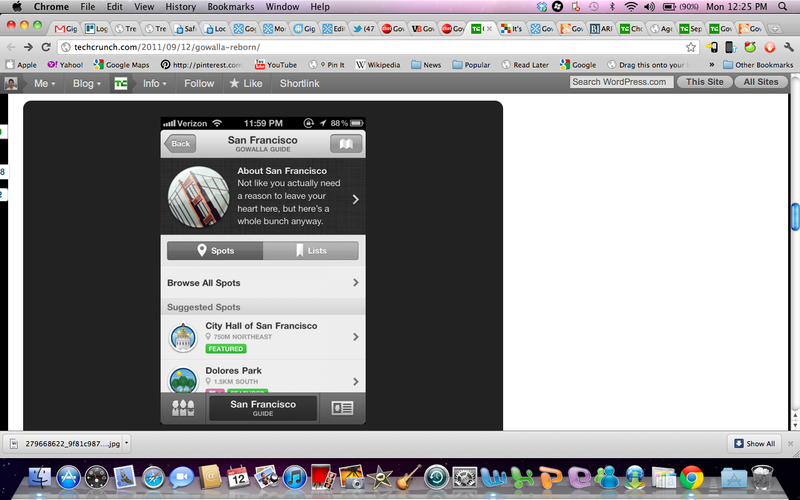 Gowalla’s user base think they got an updated checkin app when they got a travel app that can’t do simple checkins. I was a heavy Gowalla user and invested lots of time building and correcting their network. As I’ve said before Gowalla was part of my online diary, places I’ve been & things I’ve done. They effectively removed pages from my diary when they stopped being a checkin service. All of the users like myself are very disappointed and have for the most part left the service. They had a good thing going with their service, the Gowalla users were passionate because we had a better product and we knew it. Gowalla threw all of that away with the new app and service. I really don’t understand the bias the tech press seems to have towards Foursquare. Is it because of it’s founder’s roots in Dodgeball? Gowalla was always a better product. It had better design, better built in game (items were genius at the time), and while Foursquare required you to be in one of their “launch cities” to take advantage Gowalla was allowing you to check in anywhere based on GPS (and without having to enter an address to add a new place unlike Foursquare). Also, uploading photos was another Gowalla first. Gowalla just didn’t have the tech press behind it, because they were always so busy kowtowing to Foursquare. Don’t get me wrong Foursquare isn’t horrible, just from a design/functionality it hasn’t really moved beyond the check-in. Gowalla moved away from being “Just about the check-in” a while ago.